Using semi-photographic techniques to burn images into canvas, Hunger 3 is about the shadowy aftermath left in a room after a performance. 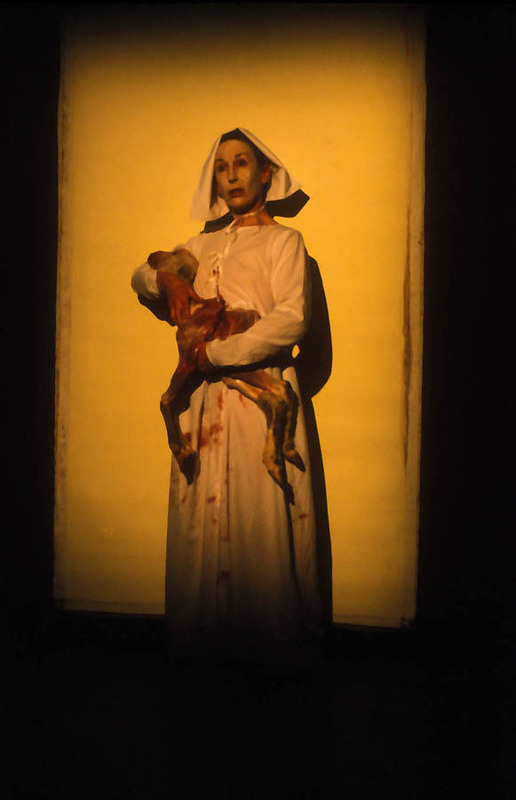 In this dark, narrative performance, Jill Orr gives birth to a skinned lamb, carrying it as her baby and then standing in tableau against a canvas treated with luminescent paint until her silhouette is burned into the painting. The room is darkened and Orr exits, leaving her shadow on the canvas, which slowly fades away. Jill Orr is an Australian artist who has been presenting performance and installation work since 1978. She has exhibited extensively in Australia and Europe, including the Brisbane Festival of the Arts, the Melbourne International Festival of the Arts and a recent Paris residency at the Cite des Arts Internationale.